Hikari Mitsushima is one hell of an actress. I haven’t looked too much into her past, but from what I gather she is a gravure idol-turned-actress, who started out with small bit parts in feature films, notably the live-action Death Note series. I have not seen these films, so this means next to nothing to me. She first really made waves in circles of Japanese Cinema fans in Shion Sono’s masterpiece, Love Exposure, as the protagonist’s obsessive love interest, who put him through hell. Though she was one of the major characters in Love Exposure, it is in Yûya Ishii’s Sawako Decides which she truly shines. After having only seen two of her films, she has already put herself in contention to be one of my favorite young actresses working today. This poster does not seem to have anything in common with the movie. Starring Orson Welles, Joseph Cotton, and Agnes Moorehead. 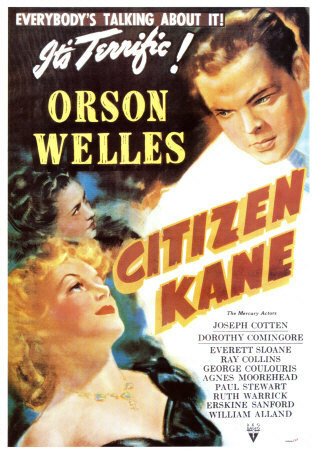 In Short: Often considered to be one of the greatest films of all time, Citizen Kane has begun to make me question my taste in films. How is it that everyone liked this film so much? While it has a few neat visual tricks that were probably considered groundbreaking at the time, the story is based on a dubious account of history, the acting is unimpressive, and none of the characters are the least bit sympathetic. Felt more like a Michael Bay film than classic Hollywood cinema. Wong Yau Nam, a child, and Shawn Yue work the fishball stand in 1970's Cheng Chau. Riley Yip’s Just One Look is a pleasant surprise of a film. Given the pop star pedigree of the cast, which includes young idols Shawn Yue, Wong Yau Nam, and both Twins (Charlene Choi and Gillian Chung), it’s not hard to come in expecting a lightweight commercialized youth romance. While romance is indeed involved, the film is also about of bitter grudges, martial arts, the transformation into adulthood, and of course, the love of cinema. Filed under Reviews Tagged with '00s, 2002, 4 Stars, drama, Hong Kong, Riley Yip, Twins! Several months ago in the inaugural post from The Guilty Pleasure Pile, I confessed my love for the masterpiece of marketing, Dante Lam’s The Twins Effect. Now, I turn my attention to another silly, fluffy film, the romantic comedy My Wife is 18, which actually just so happens to star both Ekin Cheng and Charlene Choi (the taller Twin) from my previous guilty pleasure. In fact, many of my guilty pleasures star either Ekin Cheng and/or one or both of the Twins, but I promise in the future I’ll try and cover something that people who don’t know every last detail about the Hong Kong film industry will actually care about. Filed under The Guilty Pleasure Pile Tagged with '00s, 2002, Hong Kong, James Yuen, Romantic Comedy, The Guilty Pleasure Pile, Twins! In Short: Na Hong-jin’s debut film is yet another film continuing South Korea’s recent dominance of the crime thriller genre. With a ticking-clock narrative and very clearly defined characters, it is almost impossible to not be emotionally affected by this film in some way, shape or form. Not surprisingly, an American remake starring Leonardo DiCaprio is in the works.